Everyone who works at Heartwood Soundstage is involved in the creation and production of music. But we all began as listeners and lovers of music which became a life-defining passion that led directly to the construction of Heartwood. Our goal in the construction was simple to articulate but challenging to implement: to deliver the glorious rich detail of listening to chill-bump raising music we have experienced when a perfect mix is played back through the finest equipment in a perfectly tuned studio control room. Expertly tuned acoustics: Quite simply, we designed and built (from the ground up) a room that would meet our high standards for a listening environment, using a studio control room sound field as our benchmark. The primary goal was to create a listening room with optimal reverb time (long enough to be warm, short enough to maintain clarity), with randomized (diffuse) reflections that deliver consistent, balanced frequency response listening regardless of location inside the room. In pursuit of this challenging goal, we modeled the room in software, estimated the proper mixture of sonic diffusers (located in the ceiling trusses above the stage and audience areas, with cylindrical wood diffusers at the back of the stage, and reflective panels on the side and back walls), absorbers (side and back walls, ceiling, and rear of the stage), and bass traps (ceiling, room corners), and tweaked with calibration microphones after the construction was completed. And there are no hard parallel surfaces to cause phase problems or acoustical standing waves. The result is a warm, even, acoustic ambience throughout the auditorium. As one astute visitor wrote about Heartwood, every spot is the sweet spot. 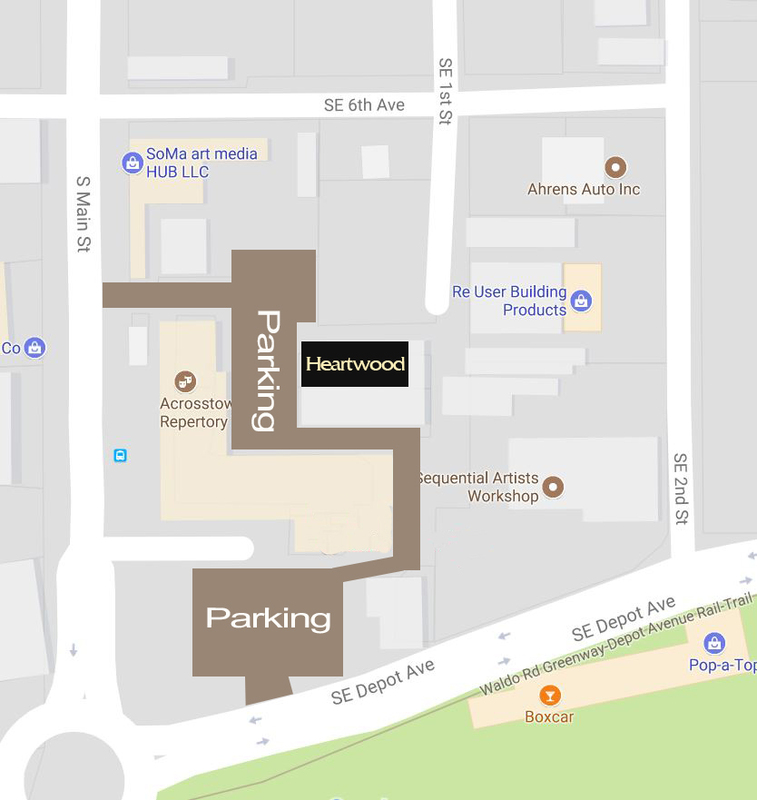 Great sound with no distractions: Heartwood is located away from high traffic routes and we spent a good deal of effort and money on soundproofing. The back wall consists of poured concrete block with an isolated layer of double drywall. The roof is made of structural insulated panels, which minimizes rainfall noise without requiring an additional isolation layer of drywall that would reduce ceiling height. The remainder of the Heartwood listening room is surrounded by double walls, built on isolated frames with as much as five layers of drywall and soundboard. Windows are double layers of thick plate glass angled down (or up on the high back wall windows) to reduce problematic reflections. Doors are solid core and press against thick weather stripping when closed. All floors are acoustically isolated from the slab. The result is an acoustically isolated listening environment that allows music to be experienced without extraneous noise distractions. And as for chatty neighbors: the expectation at Heartwood is that the auditorium is something akin to a sacred space for listening, not talking. Note that we have nothing against conversation at Heartwood, and in fact we created the Video Lounges for just that purpose. There you can visit with friends, have a drink, and still enjoy the concert in high definition and very high fidelity on a large screen TV, without distracting others. State of the art equipment: We spared no expense outfitting Heartwood with the best sound reinforcement equipment available. We had a good head start as we began with a merger of two studios (Medusa and Mirror Image), resulting a great collection of microphones (Neumann, Sennheiser, AKG, Royer, Nordic Audio, and more) and microphone preamps (Focusrite, Avalon, Manley, Midas, and more) plus enough sound amplification equipment to do outdoor shows (as in fact Mirror Image did for two years at Gainesville’s Bo Diddley Plaza Free Friday series). Then, after an exhaustive search, we chose Danley Lab synergy horns, complemented by a Danley subwoofer, for our main PA. This is a fabulous sounding system with a big bottom and silky smooth high end that evenly covers the entire room. We mix with a Midas M32 mixer and an integrated stage monitor system that allows musicians to mix their own monitors (played back through QSC K-12 powered monitors). Yes, you’re right, the audience doesn’t hear the stage monitors (not much anyway), but this is relevant because musicians play much better, and with more passion if their listening experience is great. Experienced sound engineers: Any sound person allowed to touch a fader at Heartwood has passed a rigorous background check, requiring not just years of experience mixing sound for demanding audiences, but also vetting by the CIA (Certification against Improper Adjustments, both of board settings and attitudes) and NSA (Nirvana Sound Appreciation). Every seat is a great seat: Heartwood is an intimate listening environment. Not only does every seat have great sound, but also a close enough view to count singer nose hairs. The furthest distance from the stage to any seat is less than 25 feet. In short, you will experience an intimate, unmatched listening experience. If at any moment quiet listening is not for you, you can venture out to the bar or one of three lounges, each with its own large screen TV and high-quality sound system. The show in the Listening Room is streamed to all these locations throughout Heartwood. Enjoy a tasty beverage and chat with friends while watching the show on a big 4K screen. The Heartwood Bar stocks a broad selection of beer and wine, including classic national brands and local craft breweries. The screen over the bar lets you watch the show while making your beverage choice. Chill on the sofas and comfy chairs while you watch the show on a big screen with calibrated studio monitors pumping the live sound into the room. The covered outdoor lounge has its own bar with a big screen and another studio quality sound system, giving you the concert experience on a Florida-style porch. The adjacent open-air lounge has picnic tables and an unobstructed view of the video screen – watch the show with your pals under the stars.